Psychological Flexibility? You’ve likely heard of flexibility, and chances are when you think of the term you think of the body – as in, when you do forward bends, can you touch your toes, your knees, or your thighs? (I’m working toward the goal of consistently reaching my knees.) Flexibility most definitely involves our physical selves, but it’s more than that. It’s psychological, too. Psychological flexibility involves our entire being, and it directly impacts the life we live and our sense of wellbeing. Psychological flexibility comes to us largely from the field of acceptance and commitment therapy (ACT — said like the word). ACT is researched-based approach to mental health that puts people in charge of their lives and provides tools that people can use to create their own version of a quality life, a life worth living. Like physical flexibility, psychological flexibility improves how we feel, how we move, and how we live our lives. Benefits of physical flexibility are widely known, and we can use them to increase our understanding of psychological flexibility. 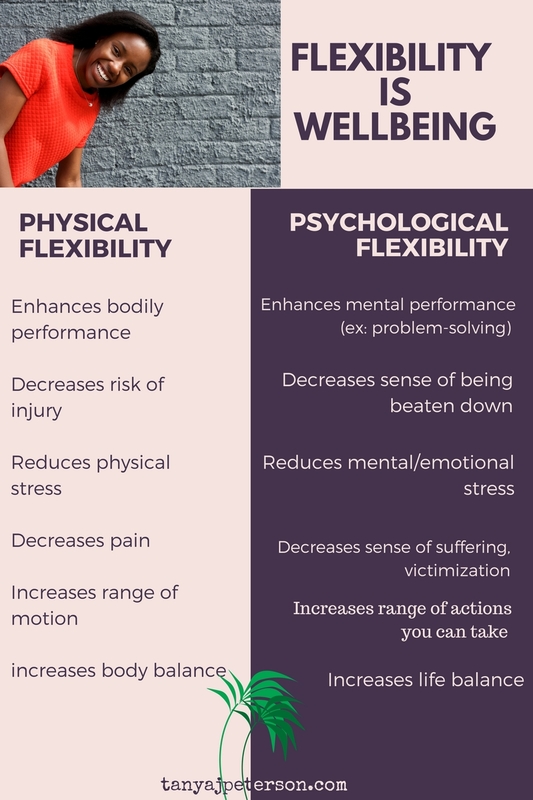 When we have psychological flexibility, our mental health and wellbeing improve dramatically. Psychological flexibility doesn’t erase our problems and challenges. Whether they’re the symptoms and effects of mental illness, difficulties in relationships, life stressors such as more tasks ahead of us than there is times, and much, much more, problems are part of our lives. When we struggle with them, fighting against them, we make them stronger. They hold us tighter and tighter, and our ability to move and live fully becomes increasingly restricted. Psychological flexibility allows us to stop struggling and start moving freely. When we have psychological flexibility, we’re not rigid. We’re not stuck in patterns of struggle. To be flexible is to be pliable. According Merriam-Webster, when we’re pliable, we’re “supple enough to bend freely or repeatedly without breaking.” That is the essence of mental health and wellbeing. Psychological flexibility is a great concept, one that’s easy enough to get on board with. Easy concept, yes. But is it easy to attain? Up next week is a look at becoming more psychologically flexible so you can bend freely without breaking. Peterson, T.J. (2016). Break free: Acceptance and commitment therapy in 3 steps. Berkeley, CA: Althea Press.